"It happens so often. 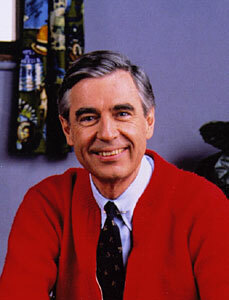 I walk down the street and someone 20 or 30 or 40 years old will come up to me and say, 'You are Mr Rogers, aren't you?' And then they tell me about growing up with the neighborhood, and how they're passing on to the children they know what they found to be important in our television work... And invariably we end our little time together with a hug. "I'm just so proud of all of you who have grown up with us, and I know how tough it is some days to look with hope and confidence on the months and years ahead. But I would like to tell you what I often told you when you were much younger: I like you just the way you are."